Well, it’s the first day of the year of the cucurbit but I thought I would make one last post about versatile and nutritious root vegetables. Last week I posted about making venison stew with potatoes, turnips, parsnips, carrots and onions which are stored in the ground, with the exception of the onions and garlic which are in my basement. 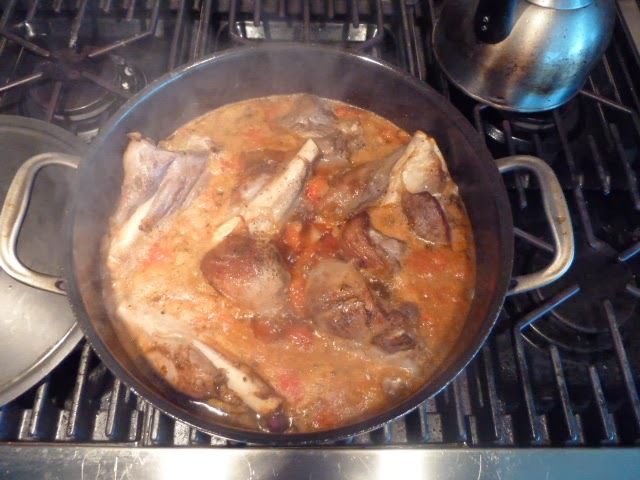 Today, Mary and I have decided to make some venison osso buco using some more root vegetables and prime summer tomatoes that we froze during the summer. I plant at least one Roma tomato every year just so that I have summer tomatoes for winter recipes. I can store about 6 or 7 in a quart freezer bag and when needed. I just grab bag and take out what I need. 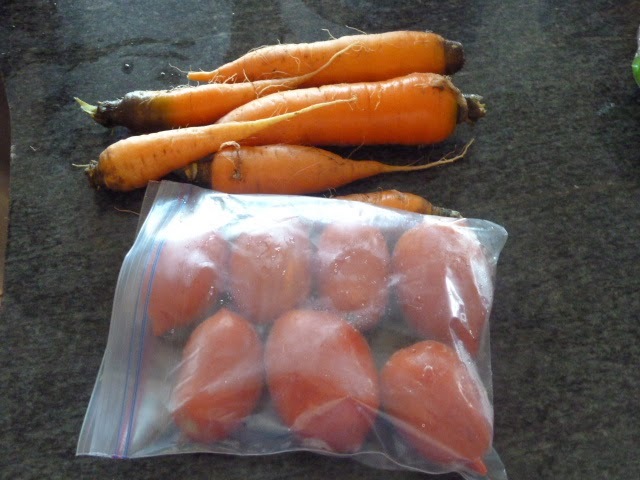 The great part about frozen summer tomatoes is that after plunking them in a bowl of water, the skins slough right off. 6 3 inch meaty veal shanks or an equal number of whole front or rear leg venison shanks about 6 lbs. 1. In a large heavy skillet heat butter and oil until hot. Working in small batches so as not to cool the skillet, brown the meat on both sides, about 10 minutes. After browned, reserve the meat on a platter and season with salt and pepper. 2. Reduce the heat on the skillet and add the onion, celery and carrot to the skillet and cook until softened, but not browned, about 5 minutes. Deglaze the skillet with a half a cup of chicken stock, using a wooden spoon to scrape any bits off the bottom of the skillet. 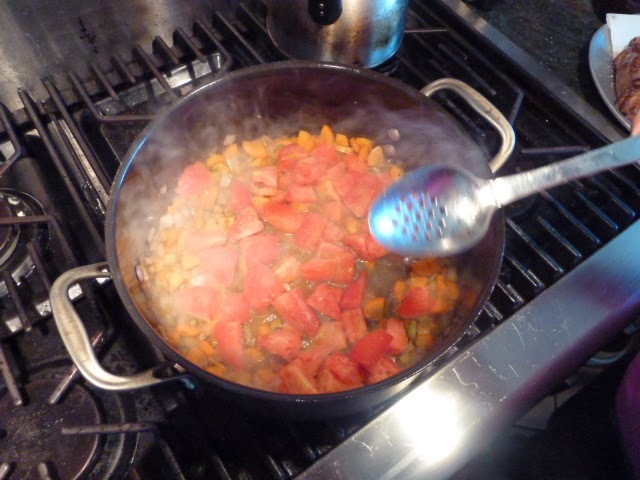 increase the heat to reduce the liquid to begin to build a flavor base in the sauce. 3. Return the meat to the skillet. add the chopped tomatoes and cover the meat with chicken stock. 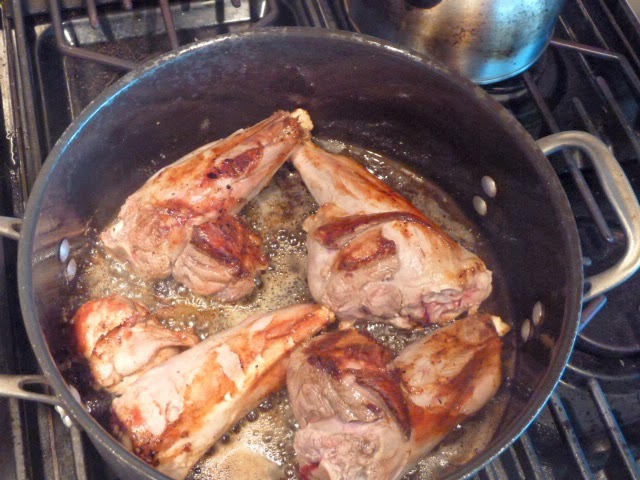 Cover the skillet and simmer over low heat for about 2 hours for veal and 3 to 3.5 hours for venison shanks or until meat is falling off of the bone. You may need to add chicken stock to keep the pan moist or partially remove the cover to allow the sauce to reduce as the shanks cook. The resulting sauce should be thick and gelatinous. 4. As the shanks cook, mix the minced garlic, parsley and lemon zest to make the gemolata. 30 minutes prior to serving, sprinkle half of the gremolata on the shanks and reserve the remainder to garnish each plate. 5. 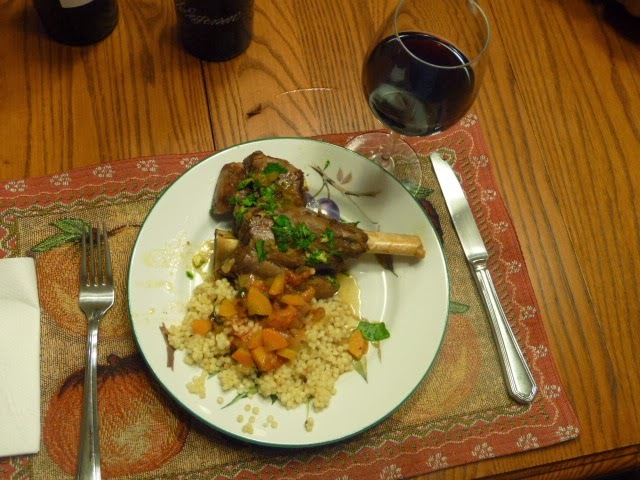 Serve the shanks on a warmed plate spooning sauce over shanks and my favorite accompaniment Israeli cous cous. Garnish the shanks with the reserved germolata and serve with a salad. It’s great eating from the garden on a cold winter day. It's great to see you cooking a great traditional dish–with most of the ingredients from your garden. The other 99/100 likely would say they don't have time to cook and would “prepare” it only if they could find osso buco in a sealed plastic container at a local supermarket. Two thumbs up for Kent & Mary!